[194 Pages Report] The Automatic Dependent Surveillance-Broadcast (ADS-B) market is projected to grow from USD 427.8 Million in 2016 to USD 1,316.9 Million by 2022, at a CAGR of 20.61% during the forecast period. The objective of this study is to analyze, define, describe, and forecast the ADS-B market on the basis of type, application, fit, component, platform, and region. The report also provides a competitive landscape of this market and company profiles based on their financial positions, product portfolios, growth strategies, and an in-depth analysis of their core competencies and market shares to anticipate the degree of competition prevailing in the market. This report also tracks and analyzes competitive developments such as partnerships, contracts, expansions, mergers & acquisitions, new product developments, and research & development (R&D) activities in the ADS-B market. The base year considered for this study is 2015 and the forecast period is from 2016 to 2022. The ADS-B value chain includes component suppliers such as Honeywell International, Inc. (U.S.), L3 Technologies, Inc. (U.S.), Esterline Technologies Corporation (U.S.), Garmin Ltd. (Switzerland), Rockwell Collins, Inc. (U.S.), Indra Sistemas, S.A. (Spain), Harris Corporation (U.S.), Thales Group (France), Avidyne Corporation (U.S.), and Trig Avionics Ltd. (U.K.), among others. Boeing Company (U.S.), Airbus Group (France), Gulfstream Aerospace Corporation (U.S.), Bombardier Inc. (Canada), and Embraer SA (Brazil) are some of the aircraft manufacturers using ADS-B developed by varied component suppliers listed above. Contracts and agreements & partnerships are key strategies adopted by major players operating in the ADS-B market. The Automatic Dependent Surveillance-Broadcast (ADS-B) market is projected to grow from USD 427.8 Million in 2016 to USD 1,316.9 Million by 2022, at a CAGR of 20.61% during the forecast period. Implementation of ADS-B in aircraft serves to be one of the most significant factors driving the growth of the ADS-B market. Modernization of air traffic management infrastructure and development of new airports globally are additional factors propelling the demand for ADS-B. Increasing volume of UAVs in airspace has further led to the need for integrating unmanned aerial vehicles with air traffic control systems, which, in turn, is anticipated to drive the growth of the ADS-B market. 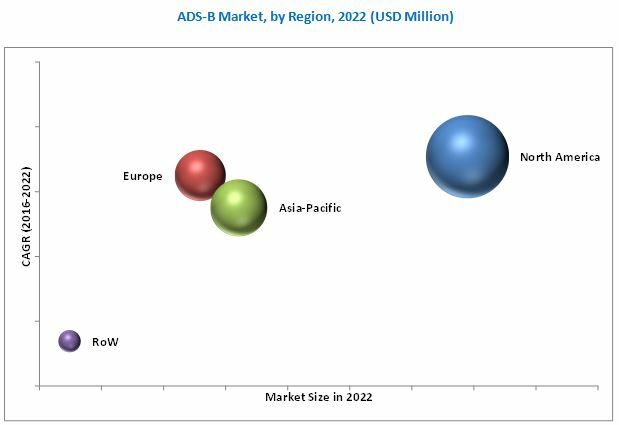 The ADS-B market has been segmented on the basis of type, application, fit, component, platform, and region. Based on type, the market has been segmented into ADS-B Out, ADS-B In, and ADS-B ground stations. Among all types, the ADS-B In segment is projected to grow at the highest CAGR from 2016 to 2022. This growth is mainly driven by additional safety features and situational awareness that ADS-B In provides to aircraft pilots. Based on application, the ADS-B market has been classified into Terminal Maneuvering Area (TMA) surveillance and airborne surveillance. The TMA surveillance segment accounted for the largest share of the ADS-B market in 2016. TMA surveillance includes services such as Non Radar Airspace (NRA) Surveillance, Radar Airspace (RAD) Surveillance, and On Airport Surface (APT) Surveillance. Increasing airspace congestion and the growing demand for construction of new airports have led to the development of efficient and safe TMA surveillance systems. Based on region, North America is projected to lead the ADS-B market from 2016 to 2022, owing to the FAA mandate for ADS-B installation on all aircraft and the presence of component integrators, Original Equipment Manufacturers (OEMs), and subcomponent manufacturers in this region. These factors are driving the growth of the North America ADS-B market. Major aircraft manufacturers have already included ADS-B in their new manufactured aircraft as a forward fit option. Other aircraft owners are retrofitting ADS-B systems onboard their aircraft. Implementation of ADS-B ground infrastructure at a national level is expected to restrain the growth of the ADS-B market. 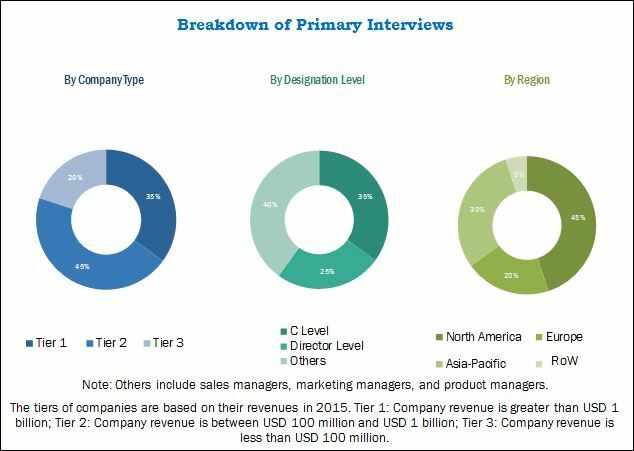 Key players operating in this market include Honeywell International, Inc. (U.S.), L3 Technologies, Inc. (U.S.), Esterline Technologies Corporation (U.S.), Garmin Ltd. (Switzerland), Rockwell Collins, Inc. (U.S.), Indra Sistemas, S.A. (Spain), Harris Corporation (U.S.), Thales Group (France), Avidyne Corporation (U.S.), and Trig Avionics Ltd. (U.K.) among others.